Mon Guerlain is a tribute to today's femininity: a strong, free and sensual femininity, inspired by Angelina Jolie. 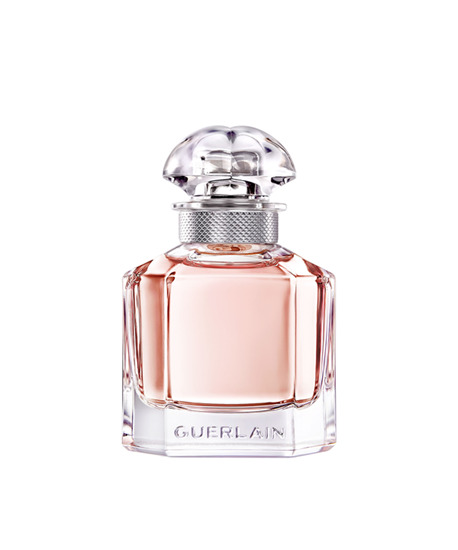 The Eau de Toilette Mon Guerlain is a cheerful fragrance like a hymn to life. A lucky perfume that offers an invitation to be bold, giving a sense of self-confidence to today's woman. This citrus oriental fragrance is a radiant fragrance as fresh as the Sambac Jasmine and the Carla Lavender that compose its floral notes beautifully enhanced by a blend of shiny citrus notes. Your Mon Guerlain fragrance in its Quadrilobe bottle: created in 1908, the bottle established itself as one of Guerlain's iconic bottles. Simple and graphic, it echoes an alchemist's bottle and owes its name to its stopper, which is crafted from one piece to obtain the four-lobed shape. A century later, beautifully enhanced by a luxurious glass weight and a white gold colored adornment, this bottle offers a contrast between strong taut lines and sensual curves, expressing contemporary femininity.